One of the surprise draws of the Dubai HeliShow was the presence of exhibitors from Russia and former Soviet Union and Soviet-bloc states. Mil Moscow Helicopter Plant was a major exhibitor, along with Kazan Helicopters, manufacturer of the Mil helicopters. Kazan was promoting work on the Mi-38, the Mi-172 with Honeywell glass cockpit and the VIP version of the Pratt & Whitney PW-207-powered Ansat transport. Alexander Emelushin, Kazan's chief manager, marketing, said that Kazan exhibits at about 20 shows annually to get information on the industry and to meet possible partners. It is also an opportunity "to have a positive influence" on potential customers, he said. In promoting the Mi-38, Emelushin said that the helicopter is in the same class as the Sikorsky S-92 and AgustaWestland EH101. It is a joint effort, designed by Mil Moscow Helicopter, produced by Kazan, with an avionics suite developed by Eurocopter. 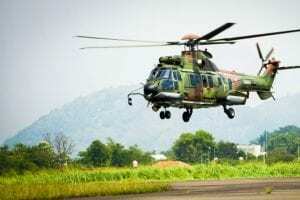 It is powered by twin Pratt & Whitney PW-127T/S engines and is designed to replace the Mi-8, Emelushin said. It is still under development, with about three years to go until production. Ulan-Ude Aviation Plant, which also produces helicopters such as the Mil-17 and more advanced Mil-171, exhibited at the show as part of the Mil exhibition booth, but stated that the show was not very productive for them. The Ural Works of Civil Aviation was at the Dubai show promoting its helicopter maintenance capabilities. The company primarily services turbine engines and gearboxes, with emphasis on the Mil-8, Mil-17, Mil-14, Mil-24, Mil-28, KA-28 and KA-32. Alexander Plotnikov, assistant director of commerce, said that there were a large number of Mil-17s in the Middle East that now need overhauls. While the Ural Works only does the engine work, it can arrange for complete overhauls of such aircraft. He noted that Ural Works uses IL-76s to transport two Mil-17s at a time to the facility in Ekaterinburg, Russia, although the company is considering whether to open a Middle East facility. "But we are not ready yet."